A derelict ship that has been taking up space on the St. John's waterfront for nearly two and a half years has finally left port. 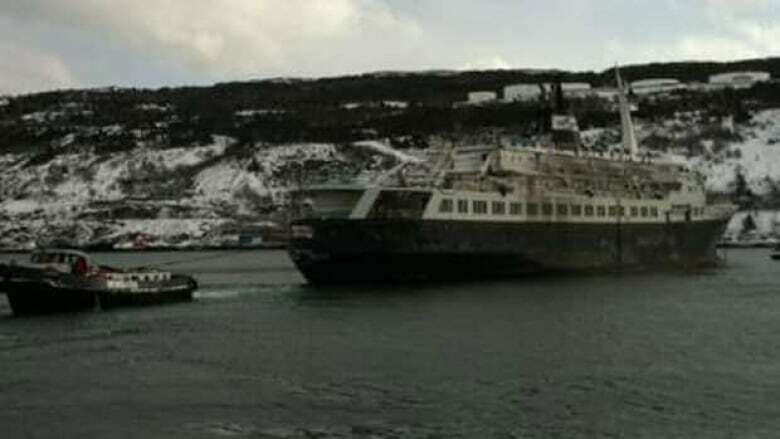 The Lyubov Orlova, an abandoned cruise ship, had its last line to the wharf cut at about 12:30 p.m., and was towed out of the harbour by a tugboat shortly afterwards. The Lyubov Orlova will be towed to the Dominican Republic, where it has been sold for scrap. The voyage should take three to four weeks. The ship was arrested in St. John's in September 2010 after a creditor put a lien on the vessel. A Russian company, Locso Shipping, owned the 90-metre Orlova. At the time of the ship's arrest, the Russian-based company owed Cruise North Expeditions $250,000. The company also owed 51 crew on the vessel more than $300,000 in wages. Since 2010, the abandoned ship has been sold and resold, all the while being moored on the St. John's waterfront. Reza Shoeybi, owner of a tugboat from Boston, arrived in St. John's in early December to prepare the Orlova for towing, and has been waiting for five to six weeks for the right conditions in which to move the vessel.